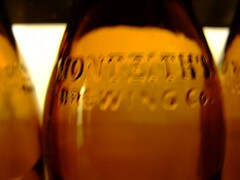 Bottles on the line in Monteith's Brewery. Excellent ales, and well worth the visit (if just for the tasting). A lot of interesting engineering work on site, and a traditional open fermenting process for all the beers.